November 26-30 – While I had hoped for a real vacation with the family, I’ll have to settle for a whirlwind trip to visit my family in Missouri for Thanksgiving. We drove all night, from 8 pm to 8 am. I snagged a few hours of sleep after we arrived, then we had a great traditional Woosley Thanksgiving, including shopping for bad gifts at a flea market for dirty bingo, lots of food and too much pie, and several cut-throat card games. November 15th – While the summer trip to Atlanta didn’t work out, we did manage to have a special date night. Anna and I got a quick dinner out, then planned to see a hockey match in Pensacola. When that didn’t work out, we opted for a late movie after visiting a bookstore. It wasn’t fancy, but it was fun with my little girl (who is growing up way too fast!). November 14th – The first Conquer 2014 Group Coaching Experience call was completed on the 14th. There are 12 members in the group and they are working their way through their plans for 2014. Expect announcements soon on the next coaching group! November 10-11: While out in Colorado for the strategy work with Teri Miller, I had hoped to get a chance to do the Incline. Timing didn’t work out, so I did the next best thing I could and hiked up a smaller mountaintop at a national park near the Miller home. It was a family outing on the 10th, with most of their seven kids joining us. But the next day I went by myself to have some quiet time and a little time with God. 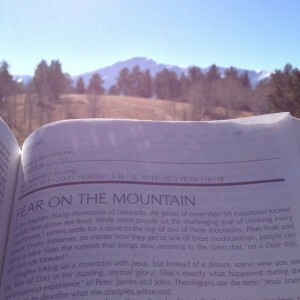 What happened was amazing…I opened my Bible to where my reading was for the day, and the bonus commentary on that page mentioned not only the mountains of Colorado, but Pikes Peak. And from where I was sitting, over the top of my Bible, sat Pikes Peak. Truly awesome! God didn’t tell me anything specifically, but I knew that whatever path my future takes, He will be with me. November 8-9 – While it wasn’t an official STRATOP, I spent two intense days working through big plans with Teri Miller for her business, Mommy Sabbatical. The first day was a long one, about 10 hours! The second was 8 hours, and over the next couple of days we talked more informally and went through project management tools. She has something very special in the works and I’m proud to have been a part of making it come to life! This one kind of just happened throughout the year. We played a little catch and a little tennis. If we have any nice warm days over the holidays, I’m sure we’ll do some more. I hope it’ll become a habit going into next year. October 18th – I had hoped to lead a Conquer Your Kryptonite class in November or December, but the window of opportunity is closing and not looking good until January. But I did speak at a local ministry group in October, so I’m going to backdate this one and call it done. (It’s my list and I can do what I want to.) Besides, I got great feedback and had a lot of fun covering a variety of financial and planning topics. November 1st – Even at 65, Alice Cooper knows how to put on a show! It was my second time seeing him, at least the fourth for my wife…and a first for my daughter. We all had a blast, including my mother-in-law! October 19th – I did the very wet and muddy 4.5 mile course in just under three hours (but I do the penalty burpees unlike others I saw). I am slow, but I don’t quit! Will write a more extensive blog post on the experience soon. October 11th – Attended the NASCAR Nationwide Series in Charlotte, NC with my buddy Mark Burch. The corporate suite and pit passes made up for it not being the Cup race! September 21st – Victory! I rode 103 miles in a single day to complete my first Century ride! 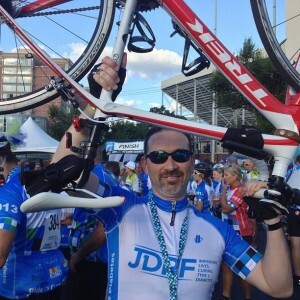 Full details at my JDRF Nashville Ride Report post. Victory! 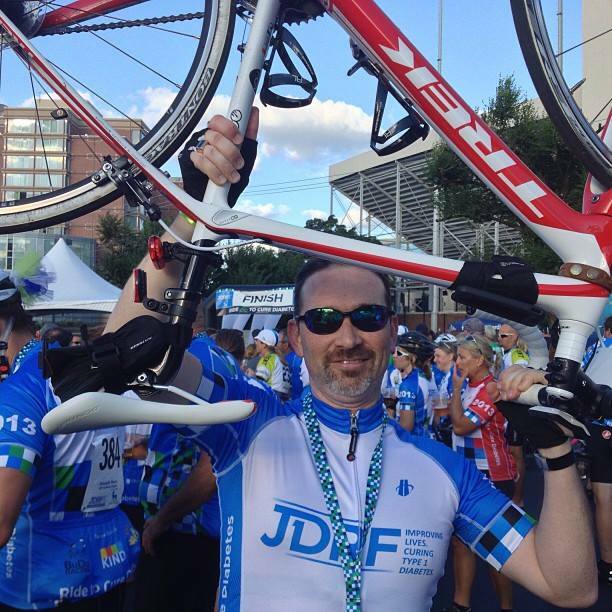 More than 100 miles completed for JDRF! Thanks to all who supported and encouraged me throughout the event! And donations are still being accepted until 9/20 by clicking here. September 8th – Finally! Today after several marathons of Minecraft, I got the boy to go outside and attempt once again to ride his bike. I pumped up his very flat tires, gave him my old helmet (he has a large cranium), and we set off for the grass field across from the house. After a successful first ride and spectacular crash–he jumped up and declared himself okay–we continued a few practice runs before getting on the street. It wasn’t pretty and it wasn’t perfect, but he did manage to complete a loop around our cul-de-sac. He’ll need a lot of practice before we can cruise the neighborhood together, but at least he’s pedaling now! July 5th – Our planned father-son trip to Missouri to visit my parents and grandparents fell through, so we had to find something else to do over the holiday weekend. Since the trip is re-scheduled for a few weeks from now, we decided keep it simple and go see Man of Steel and pig out on sushi (and we did, including some with Pop Rocks on it). It was a great guys-only day with my little buddy! June 13th – That was the day I submitted the final version to the printer. What an amazing and strange moment…almost exactly three years since I first outlined the book, it was finished. Get your copy of Conquering the Entrepreneur’s Kryptonite: Simple Strategic Planning for You and Your Business today at Amazon.com and check out the book website, ConquerYourKryptonite.com. 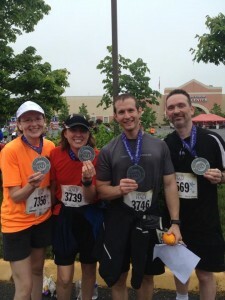 May 19th – I really wanted to do a full blog post just about the half marathon (I probably will soon), but I let the book take priority. But lets focus on the goal, and the key word is “attempt” so I completed the goal at the start of the race. Then I conquered the Marine Corps Historic Half Marathon in just over two hours and forty minutes. I may not be fast, but I beat my 2:45:00 bonus goal! 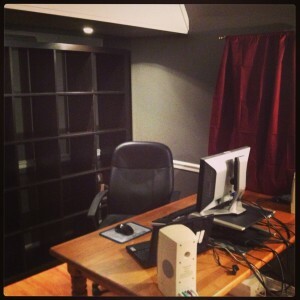 May 12th – The office is done! In a frenzied weekend, I finished all of the painting, hanging blinds and curtains, and moved in the basic furniture (including some of the goodies I got at IKEA!). There are still some finishing touches to make in terms of decorating and organizing, but the office is functional and I love working in my own space. It was perfect for finishing up the book. 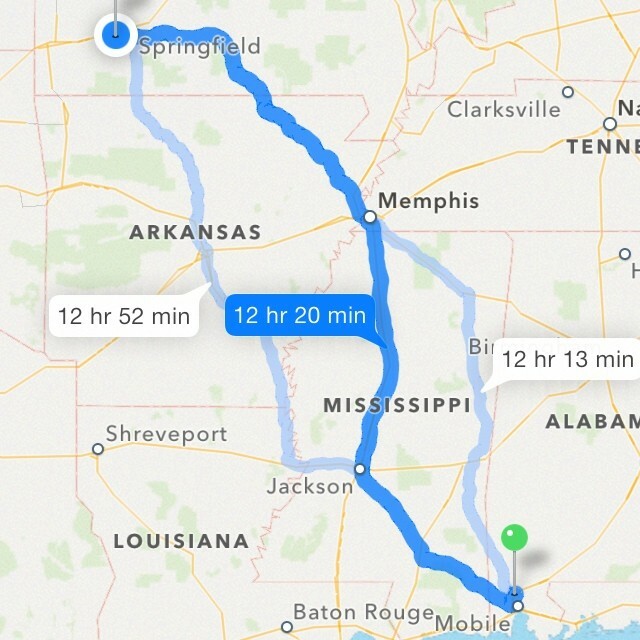 April 24th – It took a few months of rescheduling but I finally got to Montgomery! It was quite an experience seeing how government works (or doesn’t, depending on the day and the topic). Such an honor to represent my city and school system, as well as all of the public school systems in Alabama. Met with several legislators and was even recognized from the floor of the House! March 9th – The Gator Hustle 5K in 33:36 minutes. March 30th – No soft drinks for 40 days before Easter. No Change: Bins are full and ready to take to the recycling center! UPDATE: I finally made it through the Old Testament which is a challenge. I’m firmly into John, on page 1142 of the 1339 pages in my Bible. That’s 85.3% completed. I will have to up my reading time to finish, but I will finish it. No Change: Still five dates to go…November wasn’t much better from a travel standpoint. I’ll be home a lot more in December, but five dates before my birthday? Probably a long-shot, but I’ll take every one I can get! No Change: Writing a book was number one and still an amazing feat. The Kindle version was number two. (Both are available on Amazon.com). The third was the audiobook! It is available on Amazon, iTunes, and Audible! Other ebooks have had to take a backseat due to other priorities, but the coaching group is producing a new program that will be available soon. UPDATE: Hopefully meeting with someone this week to finalize plans for a podcast launch next month. UPDATE: Three days last month. I should just kill this item…I’m not a morning person! No Change: A friend and I have had rough conversations about starting a local mastermind group. It’s too early to say if it will happen, but at least this one is starting to take shape. UPDATE: This post makes 36 since the beginning of the year. That’s only one more since my last 40 Before 40 update…so really nothing in the last month. Other priorities, including the Conquer 2014 group. I’ll need a better plan for next year. No change. Still waiting for new dates to be scheduled at the local track. Not looking good. UPDATE: Started the year at about 27, and I’m now at 25.6. There have been some minor fluctuations since getting in better shape earlier this year. I may not hit my number, but I’m pleased with the progress. UPDATE: I need to average 8113 steps per day for the rest of the year to make it. Through yesterday I’ve completed 1,805294 steps. I’m 13 days behind and will have to push hard to hit 2M. But I am considering another half marathon in February…so training will need to begin soon and that could help. UPDATE: Only added another 22.5 miles in the past month. My total for the year is now 878.36. I have to average over 97 miles per week now, and the weather is getting cold for riding. Riding inside just isn’t as much fun and is a lot harder for some reason. Not looking good, but it’s been a good year anyway! No change. I did find a box with a lot of my old stuff in it!